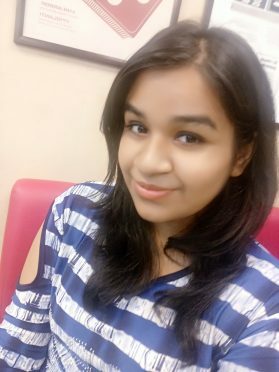 About the Author: Chetna Malhotra is pursuing BBA from JIMS College, New Delhi. She talks about her journey of getting into the corporate world and gaining new experiences. I wanted to gain some work experience during my semester break; however, being a first-year student, neither did I have enough knowledge nor the skills to achieve that. While browsing the internet to find ways to utilize my holidays, I came across Internshala and decided to give it a try. Internshala presented me with thousands of internship options. Choices like content writing, operations, and social media marketing were quite feasible for a first-year student with no substantial technical skills. Even some marketing and sales internships didn’t require an MBA degree! My confidence boosted when I realised that I could actually secure an internship in my first year. I searched for various types of internships, did a comprehensive analysis, and shortlisted the ones that matched my interest. Then, I started applying for them which was a whole new experience in itself. I would visit a company’s website to understand what it did and how it functioned before applying. I applied for around twelve internships at once and anxiously waited to hear back from them. There was no response for the first few days, but I soon received an email from Vikalp India regarding my shortlisting for the second round, which was a face to face interview. The HR, Vikram Rajput, asked fairly simple questions as I was a fresher. He asked me about my educational background, what I wanted to improve in me, where I saw myself in 5 years, etc. He also asked me if I would be able to switch my role as and when required. I answered, ‘Yes, definitely sir. As a fresher, I hope and wish to learn as much as possible. I believe that taking up different roles and profiles would only help me learn and grow in this industry’. He was pretty impressed with the way I answered his questions and hired me as an intern. Vikalp India implements experiential learning initiatives in the teaching curriculum which makes learning concrete and practical. They focus on developing alternative methods to help children gain conceptual knowledge and integrate it with the real-life scenarios. Their learning apparatus is made up of recycled paper in soy colour to denote environmental friendliness. I was very curious to explore what they had in store for me. After a two and a half hour commute, I entered the premises with a faint nervousness and met my supervisor who was working as an academic leader. She gave me a brief overview of the organisation and my responsibilities as an intern. Then she introduced me to the office staff giving me a closer view of the organisation’s culture. This was all about my first day; I have completed almost a month here now. I have been working on two projects of sales and marketing departments. For the sales department, I have to enlist the questions frequently asked during sales calls. I have made 400 calls so far which has made me more confident, honed my communication skills, and taught me phone etiquette. For the marketing department, I am working on ideating strategies for promoting the company through social media and e-commerce. I also write various articles on experiential learning. My mentor, Ayushi Mathur, has helped me overcome my weaknesses and face the corporate world. Apart from gaining a professional experience in the first year of my college, I have had the opportunity to network with senior people in the industry, which has helped me broaden my horizons. On an ending note, I want to give out a message to all the students that landing an internship in the first year might seem difficult but it is not impossible! Before applying, understand how a company functions and analyse if it suits your interest. Be confident and keep updating your resume with your extracurricular activities and technical skills. I’d also like to thank Internshala for providing me with a taste of the corporate world. Are you also a first-year student looking for a meaningful internship? Apply to these content development and social media marketing internships and get started! There many company in India that are providing free of cost industrial training for student and after that they continue hire them salary based. Thanks!